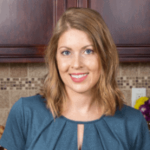 Published: Jul 1, 2017 · Modified: Apr 12, 2019 · By Jen Sobjack · This post may contain affiliate links. 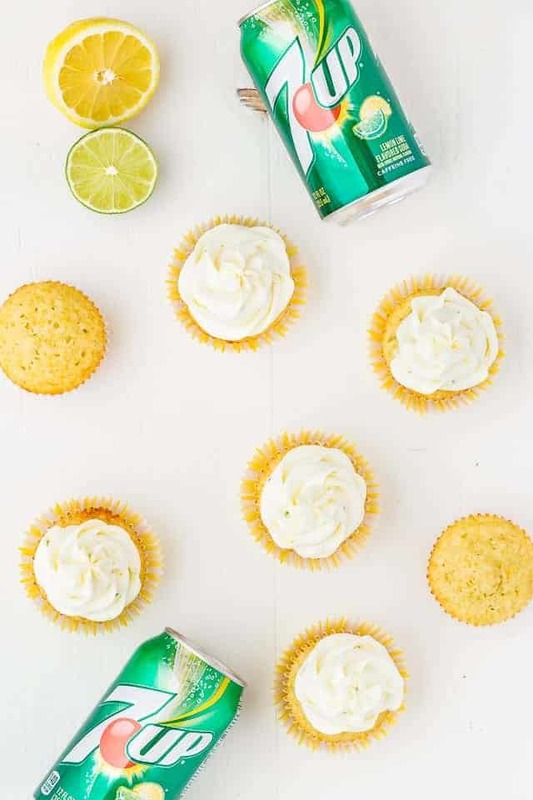 These Lemon Lime Cupcakes are a refreshing drink in cupcake form! Tangy lemon and lime flavor the cupcake and the buttercream frosting to mimic 7UP’s crisp, clean taste. These cupcakes are perfect for any summer party or get-together. It’s so hard to believe that summer is already here! The year is flying by. But, I’m thankful for warmer weather because that means more time is spent outdoors. More time grilling, BBQing, and hosting get-togethers. The weather here in TN has been perfect for days spent on the lake followed by grilled steaks and ribs. Today I’m sharing one of my favorite summer cupcake flavors that will suit all your outdoor entertaining with family and friends. 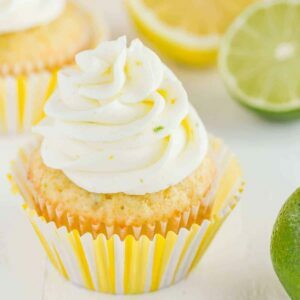 These Lemon Lime Cupcakes are super easy and come together in a snap. 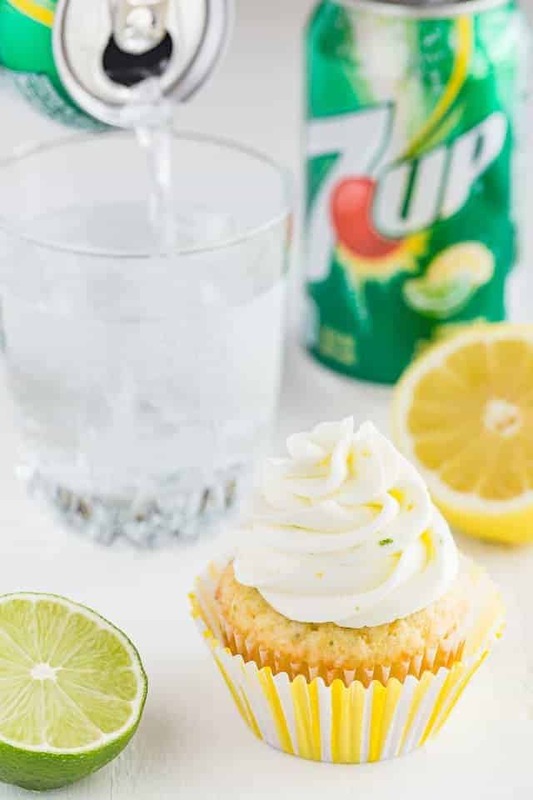 7UP is used in the batter along with lemon and lime zest for the most flavorful cupcake you’ll have all summer long. 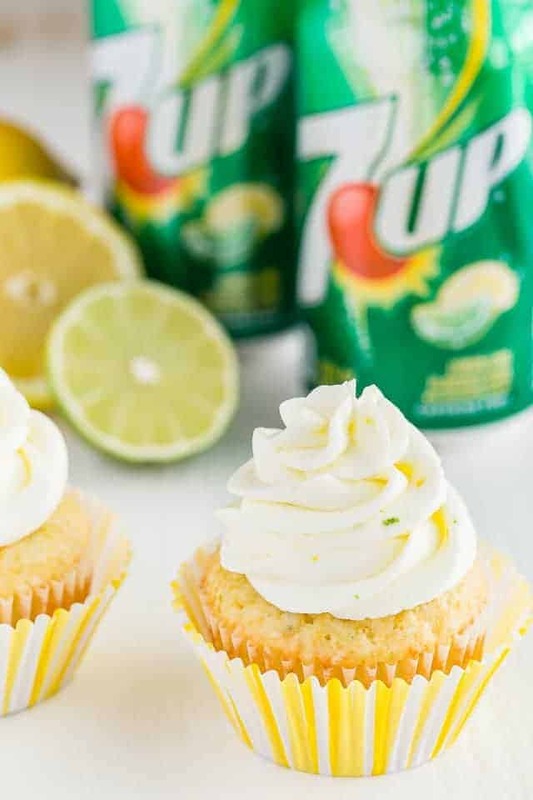 I love the refreshing citrus flavor of 7UP and these cupcakes offer just that. Plus, cupcakes are easy to transport from one place to another making them great for outdoor potlucks. Not to mention, they are adorable and fun to eat! The cupcake starts with a basic cake recipe that has been reduced to make 12 cupcakes. They’re fluffy and full of bright citrus flavor. I took my most popular vanilla cake recipe and modified it to create these cupcakes. Many of you have made that cake and it always gets rave reviews. The batter is simple. You need butter, sugar, eggs, flour, baking powder, salt, lemon zest, lime zest, and 7UP. I’m using 7UP in place of milk today. The batter comes out so flavorful and fragrant. I’m sure you’ll absolutely love the taste. Don’t fill the cupcake liners too full or the batter will overflow. Fill them just 2/3 of the way full. I like to use an ice cream scoop to portion the batter so I get uniform cupcake sizes. Because these cupcakes use soda instead of milk, it’s very important not to overbake them. Start checking them at about 16 minutes and remove them as soon as they are no longer wet in the center. Test this with a toothpick. If it comes out with wet batter, they need more time. If it comes out with a few moist crumbs stuck to it, they are done. Bake them no longer than needed to ensure they turn out moist and tender. As the cupcakes cool, you should begin making the frosting. I always set the butter for the frosting out on the counter to come to room temperature as the cupcakes bake. You’ll need more lemon and lime zest as well as a few tablespoons of 7UP. Yep, that’s right. We’re putting soda in frosting today! Beat the room temperature butter until it’s creamy and smooth. Then beat in a dash of salt and confectioners’ sugar. Once that is well combined, beat in the lemon and lime zest. Then add one to two tablespoons of 7UP and beat the frosting until it’s light and fluffy. I could seriously eat the frosting all by itself. I love how sweet and tangy it tastes. This is my new favorite way to flavor frosting! You can also find more inspiration and simple summer recipes using 7UP at 7UP.com. 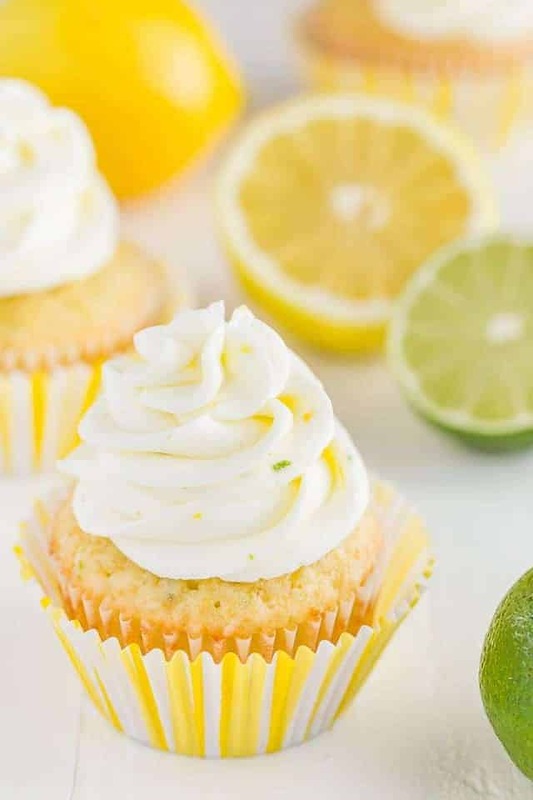 These Lemon Lime Cupcakes are a refreshing drink in cupcake form! Tangy lemon and lime flavor the cupcake and the buttercream frosting to mimic 7UP’s crisp clean taste. These cupcakes are perfect for any summer party or get-together. Preheat the oven to 350°F. Line 12 muffin cups with cupcake liners; set aside. In a large bowl, beat the butter and sugar together until light and fluffy, about 5 minutes. Add the eggs, one at a time, mixing well after each addition. Beat in the lemon zest, lime zest, and vanilla. Combine the flour, baking powder, and salt in a medium bowl. Stir with a whisk and add it to the butter mixture alternately with the 7UP, beating well after each addition. Divide the batter evenly among the prepared muffin cups. Bake for 18-20 minutes or until a toothpick inserted into the center comes out with only a few dry crumbs. Cool for 10 minutes. Remove cupcakes from the pan and cool completely on a wire rack. In a stand mixer fitted with a paddle attachment or with an electric hand mixer, beat the butter on medium-high speed until smooth. Add the salt and continue to beat until incorporated. Add 1 cup of the confectioner’s sugar, beat on medium-low speed until most of the sugar is moistened. Beat in the lemon and lime zest. Gradually add in the remaining sugar, one cup at a time. You may need more or less depending on how soft the butter is. Beat on medium-low speed until the sugar is moistened. Add the 2-3 tablespoons of 7UP depending on how creamy you want the frosting to be. Turn the speed up to medium-high and beat until light and fluffy. Scrape down the sides of the bowl as needed. Frost the cooled cupcakes any way you like. The cupcakes can be made 1 day in advance. Cover and store them at room temperature. The frosting can also be made a day ahead. Store it in an airtight container in the refrigerator. Store frosted cupcakes in an airtight container for up to 3 days in the refrigerator. Cupcakes can also be frozen for up to 3 months, frosted or unfrosted. Thaw in the refrigerator overnight.